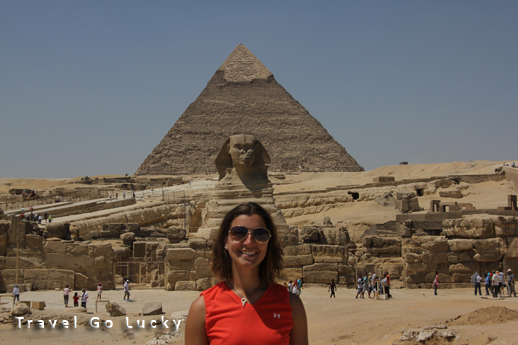 Our next highlight of the trip came with a visit to one of the most revered architectural sites in the world: The Pyramids of Giza. A short twenty minute taxi ride to the outskirts of Cairo, and we there we were: standing in front of stones that were put into place almost 4700 years ago, with the Great Pyramid serving as the world’s tallest man-made structure for over 3800 years. But you’re not here to read about that, right? 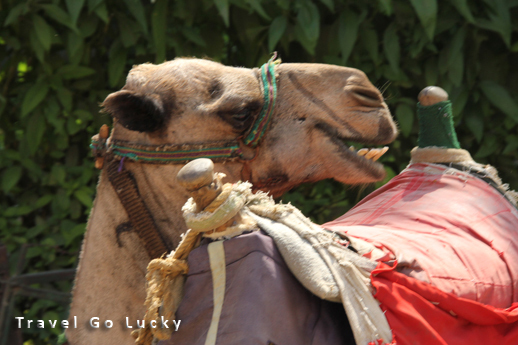 You’d rather hear about how our taxi driver would drop us off at his friend’s camel and horse rental shop, and then have said camel renter try to get Dana and I to pay EIGHTY DOLLARS for the privilege of riding a camel to see the pyramids. Of course, because there’s drama in that. Well you’ll be happy to know I certainly didn’t accept that price and told him I’d pay ten dollars for each of us, or we’ll leave. While this sounds pretty cut and dried now, at the time of negotiations it really sucked. Haggling when you’re surrounded by eight guys who then try to block the door when you threaten to walk out of their shop is not the most pleasant experience. In the end, the owner took our twenty dollars and I got to spend the next two hours on top of one of the most uncomfortable creatures in the world. We would have been much better friends if I just walked next to him. If given the choice between riding a camel and walking barefoot through the hot sand to see the pyramids, I would now think long and hard about the barefoot option. Let’s just say that I walked kind of funny for the next few days. Further compounding my annoyance with Egyptian sales techniques, some guy strolls out of his shop on the way to the pyramid entrance, stops our guide, and puts two keffiyahs on our heads (Those goofy looking white cloth things with a headband around it that Lawrence of Arabia is famous for wearing). He then takes our picture and expects to paid. Ugh. The pictures were terrible, and the best part is I HAD ABSOLUTELY ZERO PERCENT INTEREST IN WANTING THIS TO BE DONE. I gave him 5 Egyptian Pounds for his trouble (equivalent to $1) and he then muttered some terrible things about me in Arabic as we finally got into the entrance. 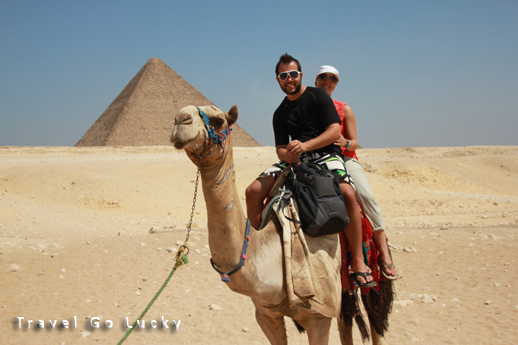 After all of this, we made our way across the blistering hot sand to see the pyramids. They were fantastic. 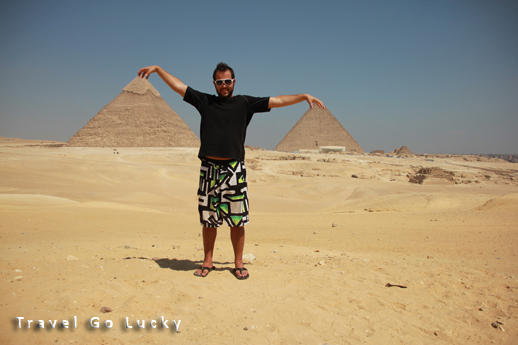 They were much bigger in person, and the Great Sphinx was much smaller in person. Our camel guide, Ahmed, a teenager who was actually a wonderful guide (as opposed to the other people who provide unsolicited opportunities to take your money), took some really funny perspective pictures that made us look like we were holding the pyramids in our hands. Never thought I could lift this much. 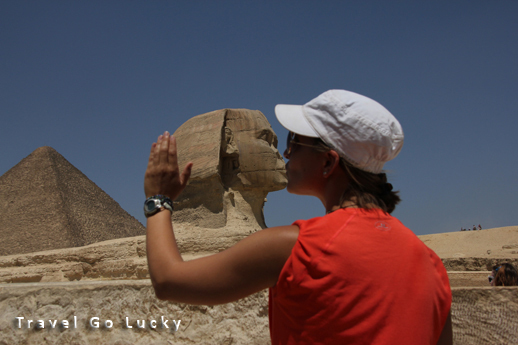 Dana totally made out with Great Sphinx. Wow, check out that vertical. 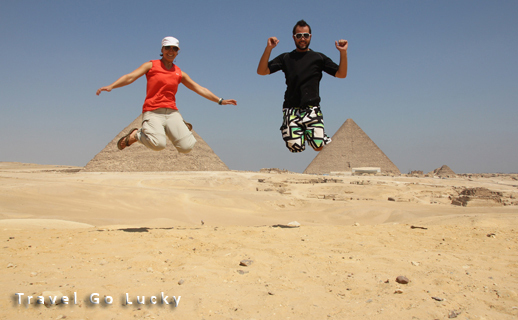 Our time visiting the Pyramids was a lot of fun, even though there were more than a few annoyances along the way. I don’t want to sound like customer service is non-existent in Egypt, either. Our hostel manager, Mohammed, did a great job making sure we were taken care of, writing taxi instructions for us in Arabic and letting us know what price is acceptable when a taxi driver quotes us. If you happen to go to Cairo in the near future, be sure to check out his Arabian Nights Hotel.